PV Sindhu beat Evgeniya Kosetskaya 21-13, 21-19 to march into China Open second round. PV Sindhu began her China Open campaign on Tuesday with a thumping straight-game victory over Evgeniya Kosetskaya of Russia. The Indian badminton star took just 29 minutes to demolish her unseeded opponent 21-13, 21-19 to set up a second round clash against Busanan Ongbamrungphan of Thailand. Despite a slow start in both games, Sindhu put in a solid performance to give little chance to her Russian opponent. In the beginning of first game, both players fought tooth and nail for the lead with the Russian shuttler even going 7-5 in front. However, Sindhu immediately upped the ante, winning six consecutive points to take a decisive 14-8 lead. Evgeniya Kosetskaya never recovered as the Indian star easily managed to wrap up the game 21-13. The second game was completely different from the first with the Russian putting in a dogged performance to keep Sindhu on her toes. 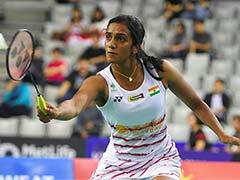 At the start of the second game, the 23-year-old Indian shuttler streaked into a 3-0 lead but Evgeniya Kosetskaya stunned Sindhu by winning four straight points to take a 4-3 lead. Sindhu came roaring back to be 10-7 ahead but going into the mid-break, the Indian shuttler led by just one point. After the break, Sindhu won three points in a row to hold a comfortable 15-10 lead. However, unlike the 1st game, Evgeniya Kosetskaya was in no mood of giving up, winning five consecutive points to draw level at 15-15. With the match hanging in the balance at 19-all, Sindhu won two straight points to win the game 21-19 and wrap up the match. In the women's doubles event, Sikki Reddy and Ashwini Ponnappa crashed out in their Round of 32 while in the men's doubles event, the Indian team of Manu Attri and Sumeeth Reddy lost 16-21, 25-27 to sixth seeds Kim Astrup and Anders Skaarup Rasmussen of Denmark.